QColorDialog::DontUseNativeDialog 0x00000004 Use Qt's standard color dialog on the Mac instead of Apple's native color panel. Returns the custom color at the given index as a QRgb value. On Symbian, this static function will use the native color dialog and not a QColorDialog. On Symbian the parameters title and parent has no relevance and the options parameter is only used to define if the native color dialog is used or not. Pops up a modal color dialog, lets the user choose a color, and returns that color. The color is initially set to initial. Диалог является дочерним к parent. It returns an invalid (see QColor::isValid()) color if the user cancels the dialog. 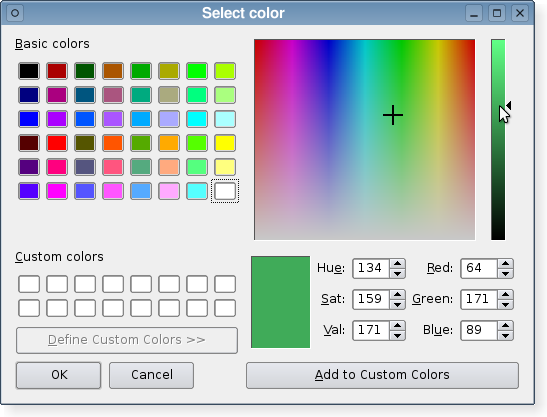 On Symbian, this static function will use the native color dialog and not a QColorDialog. Sets the custom color at index to the QRgb color value. Note: This function does not apply to the Native Color Dialog on the Mac OS X platform. If you still require this function, use the QColorDialog::DontUseNativeDialog option. Sets the standard color at index to the QRgb color value.